Like internet stores, online second hand shops have their attractions and drawbacks. A plus is that many people will read your ad, another is that you needn’t go anywhere with the item and you can use it until you sell it. And you set the price. Jarmark, the freely accessible site operated by Mladá fronta Dnes, is a good place to start up your virtual business. Click on “ostatní” (“others”) on the main news page to get there, then you can look for or offer products in almost 100 categories. Most buyers want to examine second hand products, but they can’t on the internet. So try to describe the item in as much detail as possible, and you can expect to hear from people in your area rather than from the other side of the republic. For registered users this site offers the option of saving the link to the Memobox if you find something interesting. At this well laid out site with enormous turnover you can auction anything from cars to animals. Using all the services provided is free upon registration; then you can offer something for sale or bid on something you want. The main page offers tips on the best and cheapest items, and if you want something specific, just browse the appropriate category. Individual auctions are held during precisely defined periods of time. If you can’t be on line at that time, just enter the starting price and your maximum bid, and the system bids up for you, by increments of as little as a single crown. A simple-to-use second hand shop focusing exclusively on sales and purchases of mobile phones. Nokia, with over 1,000 handsets, leads in the sales offer, with Bosch bringing up the rear with just a couple of dozen.The site also offers prepaid SIM cards from different operators or already activated fixed contracts due to expire. If you want to sell a handset, click on “přidání inzerátu” (insert ad), where you enter the brand and type, e-mail, price, and the obligatory password. 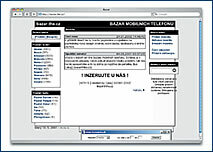 One of the oldest Czech internet second hand stores is intended mainly for private users. You can look for or offer items in 20 categories, and in each category it’s usually possible to offer up to three items. By sending paid SMS messages, items can be moved to a choice place on the page, otherwise they’re arranged by year and month. The map in the upper right corner of the page is useful, because you can select the region where you live so as not to get offers from people too far away. To limit your search, choose a category and sub-specifications and the date of the ad. A virtual version of the printed medium, very useful for finding a price, or to see if the sought-after item is for sale. 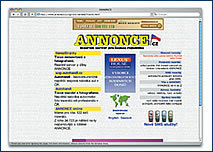 The up-dated site holds nearly 120,000 ads on six sites – Housing, Cars, Leisure, Friendship, Jobs, and SMS. You can also enter free private ads in the printed version over the net. 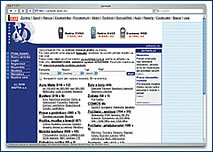 Just enter a text of up to 220 characters at http://www.annonce.cz/pcinsert/insert/ Insertintro/index.jet and send. Within 24 hours after editing, your offer will appear on the site and in the next issue of the paper. If you want to highlight it, you will pay CZK 150 and up. This site is part of a project whose aim is to voluntarily bring together the large community of Czech experts like witnesses, interpreters, appraisers, attorneys, authorized engineers and technicians. If you need help from one of them, or are engaged in similar activities, you will certainly find inspiration here. One of the largest, fastest, and best laid out sites, it contains databases of over 1,800,000 firms and Czech web sites, arranged both by field and location. A comprehensive internet encyclopedia currently containing over 100,000 entries. It not only finds data, but also offers interesting information from all fields. Just enter a question into the search window at the top of the page and wait. Here you can find almost anything you want to know about the Czech internet, from its history to current events and the latest trends. – Don’t be ashamed if you haven’t heard of this service. The media will start writing about it in the coming months, once the new generation of mobile phones supporting the service arrives. These handsets will have an inconspicuous button on the side for converting it to walkie-talkie! The advantage is that you can communicate with several parties at the same time, which is great for coordination purposes. But a negative is that only one person can speak at a time – so it’s “only” duplex communication. Furthermore, Push to Talk doesn’t support ring tones, so your handset will just start talking – you don’t have the option of rejecting the call.